I am a 35-year-old creative entrepreneur. I have an extensive background in the creative arts studying various mediums such as fine arts, fashion production, jewelry design, crochet, graphic design, cake decorating, and screen printing. I have also worked in the corporate financial field in London for over 15 years. In 2014, I began crocheting as a form of art therapy after being diagnosed with mental illness and as a Mental Health advocate, I actively encourage open dialogue around the subject through workshops, webinars, and T-shirt campaigns. I am also a champion for the handmade community in London and co-founded the Merry Makers Fair, a series of local, handmade shopping events aimed to encourage and support small handmade businesses. You can find me most days in my home studio in Old South crocheting and listening to podcasts or working at my booth at the Western Fair Farmer's Market in Old East Village. Wooly Maple is a hand crafted apparel and accessory brand specializing in crochet hats and screen printed goods. The brand's beginnings came from the need to earn income during an extremely difficult time in my life. In 2015 I was diagnosed with Borderline Personality and began treatment in an outpatient therapy program at Victoria Hospital. Unable to find an employer that would accommodate my therapy schedule or support my recovery, it became critical to find a way to support myself. I have enjoyed crocheting as a hobby for over 10 years, but not until rediscovering it as a form of art therapy while in treatment did I fully understand the healing benefits it could provide. What started as a coping mechanism soon turned into my vocation and Wooly Maple was born. Crocheting hats and other winter accessories supported me financially for 6 months until I finished treatment and began working in the investment field. 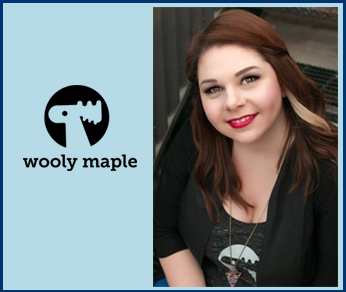 Wooly Maple became a part time business while I focused on my new career. Although I saw success in the Financial Sector the pressures of the corporate world were proving to be damaging for my mental health and overall well being. In March of 2017 I decided to invest in my happiness and quit my job, taking Wooly Maple full time. Since then, Wooly Maple has seen many milestone achievements such as product expansion into screen printed clothing, a permanent retail location, various awards such as Our London Reader's Choice, numerous press pieces including VICE Canada, the launch of our Learn to Crochet Workshop Series and most recently a recipient of the Starter Company Plus Grant Program through the Small Business Centre. Was there something that drew you to becoming an entrepreneur? Living with mental illness, self care is extremely important to me. While working my 9 -5 career, I found it very difficult to strike a work-life balance that provided me with the amount of rest and downtime that I needed. In my experience most employers promote that they encourage work-life balance, but the reality is that often isn't the case. High pressure deadlines, intense work loads, and imposed overtime chipped away at my well being, and would often force me to take sick or personal days to recoup. Working for myself allows me the freedom to set my own schedule and work when I'm most productive. Ironically the hours are much longer, and the work load is much, much heavier as an entrepreneur! Now, however, I can work when I am feeling most creative and inspired and take time for self care when needed without risk of looking like a “bad employee”. What are some of the challenges you faced when starting your business? Honestly the biggest challenge I faced was my own self doubt. Starting your own business is terrifying (in the best way!) and I was just plain scared to take the plunge. The best advice I received during the time leading up to taking Wooly Maple full time was “Get out of your own way”. Often our biggest limitations in life are our own mindsets and attitudes. Once I “got out of my way” and bet on myself, opportunities presented themselves in all kinds of ways. My best advice is to surround yourself with people who want to see you succeed and align yourself with people who are where you want to be. Being an entrepreneur is tough work and still makes me feel “Ugh, why did I think I could do this?” at least once a week. I don't think that ever goes away. So, it's important that the people on your team make you feel like you can do it (because you can!). Leave no room in your life for negativity or nay sayers. Lastly, reach out to peers in your industry who you view as a success. Don't be intimidated or afraid to ask for help from those who are already doing the work. Most entrepreneur have a wealth of knowledge that they learned through trial and error and are usually eager to share.